Judaism pays utmost respect to life, and also to the body in which life deceased and the sole left it. The main element of the Jewish funeral is the interment of the deceased and assurance of the inviolability of the grave and the entire cemetery. Exhumation is allowed only in exceptional circumstances, e.g. if the body has been buried in other place than Jewish cemetery. The grave site is eternal and it is prohibited to upset the eternal quiet and peace of the deceased. This is why one of the Hebrew names for the cemetery is beth olam, i.e. the home of eternity. Undated postcard from the old Jewish cemetery in Prostějov (photographic collection, Prostějov Museum and Art Gallery). The gravestone is held to be the inalienable property of the deceased. It is a gift to the dead, who is supposed to stay at the burial place forever. It shall never be used for any other purpose, e.g. pavement of a yard, building of a house, or making of another gravestone. 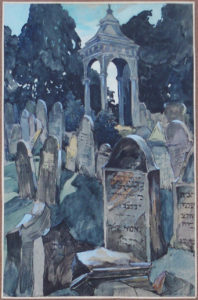 The gravestone was typically donated to the deceased by his/her family (husband, wife, children); a penurious member of the Jewish community could have the gravestone donated by the burial confraternity or the religious congregation. Beside burial place, historic gravestones often yield important facts of the life and family relations. Gravestone inscriptions were in Hebrew till the end of the 18th century. 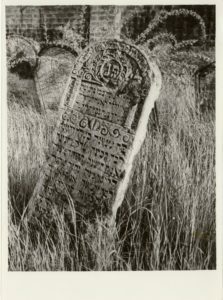 The name, and perhaps also the date of death, of the deceased began to appear on the gravestones during the 19th century; the use of Hebrew was discontinued over time and personal information grew more concise. 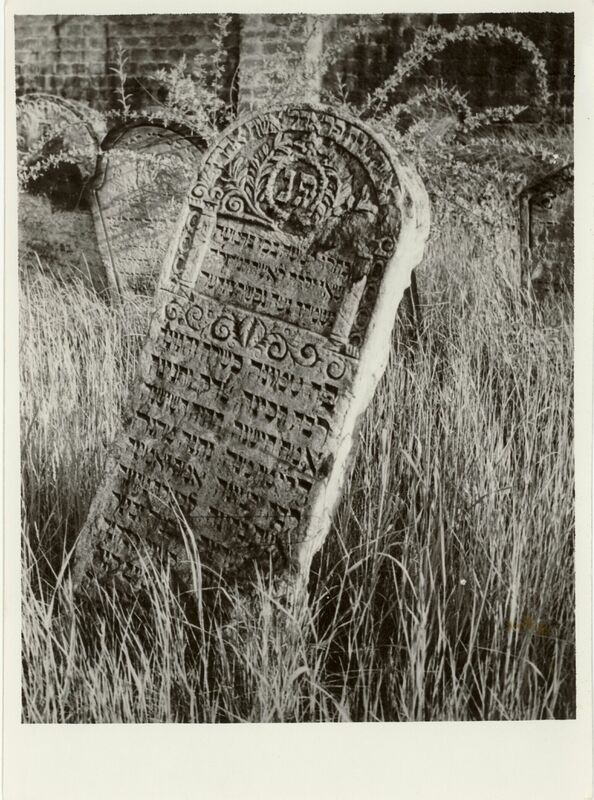 The old Jewish cemetery in Prostějov had traditional tabular sandstone gravestones with Hebrew inscriptions on its south side, whilst more recent granite or marble prevailed on the north side adjacent to today’s Studentská Street. 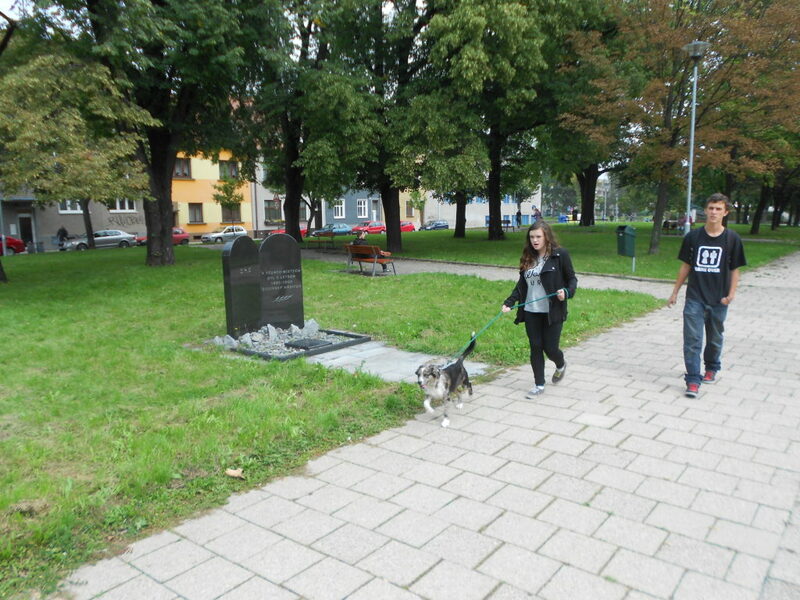 The old Jewish cemetery, founded in 1801 in the area limited by today’s Lidická, Studentská and Tylova Streets, was one of the most interesting places in Prostějov. Access to it was through the Neo-Classical gate from today’s Lidická Street; next to the gate was a small house with a garden. The cemetery was not bounded by the wall in the first few decades of its existence; it was probably erected sometime after 1833. This is why the gravestones of some older graves at the boundary were built into the wall. A road flanked by trees ran down the middle of the area; some of them can still be seen in the park. A total of 1,924 gravestones were located in the area of 6,528 sq. m. this information is available thanks to the diligence of the Prostějov funeral confraternity, whose members copied legible parts of the gravestone inscriptions at the beginning of the 20th century and drew a detailed plan of the grave sites. The cemetery was split to 20 groups. A ceremonial hall was located in the middle of its north side at today’s Studentská Street, and the plan shows a small entrance next to it, probably the so-called Cohen Gate. The last funeral was conducted o May 11, 1908. The municipality intended in the 1930’s to buy the Jewish cemetery and erect a public building there, surrounded by a park. The talks began in 1938, but the Prostějov Jewish congregation was, for religious reasons, only willing to sell property which was not part of the cemetery proper. Mayor Sedláček wrote to the Ministry of home Affairs of the Protectorate on August 1, 1939: “There is an old Jewish cemetery in Prostějov, located in the built-up part of the town, where no burials have taken place for many years; the site of the cemetery is of no benefit to anyone, and hinders the development of the town. For this reason the municipality discussed with the Jewish Religious Congregation in Prostějov the purchase of the site, and when the talks got to a standstill due to the absolute disagreement of the representatives of the above congregation, the Council of Prostějov resolved on June 28, 1939, to expropriate the site of the old Jewish cemetery for necessary reasons of road building and sanitation.” The council miscalculated. The Reichsprotektor issued a decree on Jewish property in June, and in the end the cemetery was “aryanized” and became the property of the Reich. The municipal administration was also altered during the occupation, and the Jewish congregation was dissolved. From June to July 1942 almost all the Jewish population of Prostějov was taken to Terezín. Thus the German Mayor Maxmilian Girth had to wait till 1943 to purchase the cemetery site for the town from the so-called Emigration Fund for Bohemia and Moravia, which held all the Jewish property in the Protectorate. No written record of the demolition of the cemetery is available. What is available is a series of photographs showing what the site was like just prior to the demolition. The graveyards are numbered or just marked with a cross. Analogously to other places in the country and according to the memories of witnesses and recent finds, quality gravestones were offered for sale to stonemasons and other possible processors; older tabular gravestones of soft stone were used for out-buildings in Prostějov and its vicinity. The area without gravestones was to be used as training ground. 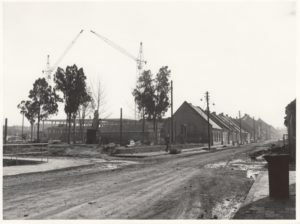 As German property, the site of the cemetery was returned to the municipality after the war, and has been its property ever since. Site served as playground after the war; children used to report to their parents they were going to play on “Žiďák” (Jewish place). Lawyer Bohuslav Kraus (b. 1907-11-28 in Prostějov, d. 1983-4-2 in Prostějov) noted that itinerant fun-parks used to stop in the eastern part of the cemetery in the 1950’s. Kraus criticized this situation, claiming people were “dancing over dead bodies”. Ideas even occurred later that a municipal swimming pool could be developed there. A park was arranged there at last. A school building was erected in 1970-1974 next to the southern boundary of the cemetery and a parking lot was built in the western part of the site. The municipality had monument installed on the site of the cemetery in 2001, whose author was Architect Blahoslav Adamík. The inscription on its right flank reads: “Jewish cemetery was here in 1801-1908”. However, as a matter of fact the cemetery and its gravestones survived well into the German occupation at least till 1943. As the bodies are still there in spite of the various building projects, the site is still a cemetery according to the Jewish tradition. This is in fact the main reason behind the initiative to rehabilitate the old Jewish cemetery. (For more detailed history of the cemetery, see the 2008 study of Marie Dokoupilová The Demise of the Second Jewish Cemetery in Prostějov).